Santa Ana Police Chief David Valentin invites you to a unique opportunity to provide input on establishing the Department’s Policing Philosophy. This invitation is centered on his open servant leadership approach to providing the best policing services possible for everyone in SANTA ANA. Santa Ana Police Athletic & Activity League located at 2627 W. McFadden Ave.
Delhi Community Center located at 505 E. Central Ave.
Santa Ana PD Community Room located at 60 Civic Center Plaza. 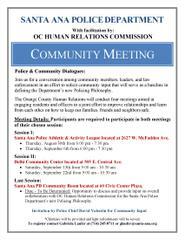 •	Date - To Be Determined: Opportunity to discuss and provide input on overall collaboration with OC Human Relations Commission for the Santa Ana Police Department’s new Policing Philosophy. 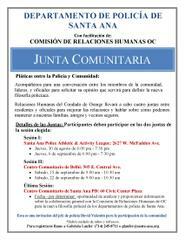 Santa Ana Police Athletic & Activity League: 2627 W. McFadden Ave.
Centro Comunitario de Delhi: 505 E. Central Ave.
•	Fecha - por determinar: oportunidad de analizar y proporcionar información sobre la colaboración general con la Comisión de Relaciones Humanas de OC para la nueva filosofía policial de los departamentos de policía de Santa Ana.